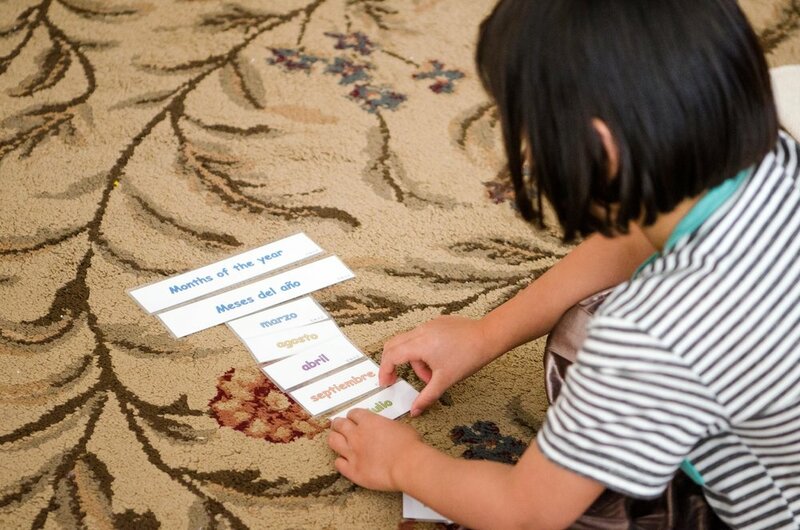 Mission Montessori offers an optional Spanish immersion environment in our toddler, primary, and elementary programs. So children can begin in Spanish immersion at our school as young as 18 months. In Spanish immersion, both teachers speak exclusively to the children in Spanish except for their English reading and writing lessons which begin when a child is 5 years old. Our Spanish instruction is strongly rooted in Montessori principles so students learn Spanish organically, not didactically. Developing fluency in written and spoken Spanish enables students to communicate with native Spanish speakers at home and abroad and opens up the world of Hispanic culture, from literature to art to music. Bilingualism has demonstrated cognitive, academic, and personal benefits for young students, fostering strong thinking, problem-solving, and communication skills and heightened empathy. Bilingualism is also additive: the Spanish language skills learned support competency in English. In the Montessori bilingual environment, students develop intercultural skills and gain confidence in navigating the world and life. Spanish is the second-most natively spoken language in the world, outranking English, and one of the most important languages in international business. By 2050, the United States is estimated to become the largest Spanish-speaking country in the world. Further, the US Census estimates that more than 11% of San Franciscans and nearly 30% of Californians speak Spanish. It is part of the cultural fabric of our city and our state!